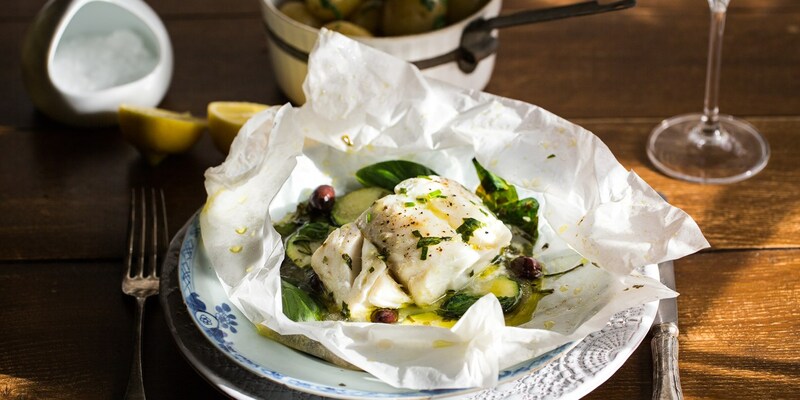 The French term en papillote translates as 'in parchment', literally describing the cooking method which involves cooking fish (or, less commonly, meat or vegetables) in a pouch of paper or foil and baking in the oven. The enclosed parcel traps in any moisture released while cooking, resulting in tender, juicy flesh which is part steamed, part baked. Cooking en papillote is, therefore, a fantastic trick for healthy recipes as very little – if any – oil is required during the cooking process. That said, however, oil, herbs, spices and other ingredients can be added to the parcel before cooking in order to infuse the finished dish with beautiful, fresh flavours. This collection of baked fish recipes aims to showcase the en papillote method, demonstrating the wide variety of flavours and fish which benefit from it. Louise Robinson's baked cod recipe combines the prized Skrei variety with olives, spinach and herbs, while Shaun Rankin pairs popular flavours from Thai cuisine with his Haddock en papillote, including lemon grass, coriander and chilli. For a delicious salmon recipe try Josh Eggleton's Salmon en papillote with wine and fennel, or Andy Waters' mixed shellfish recipe with salmon, mussels and prawns cooked en papillote to make a healthy seafood platter.